Just because you've finished the Communicating Visually Workshop, doesn't mean you can't still use the awesome resources. Bookmark this page for easy access to the resources you used in the course. freeimages.com: Definitely one of the most popular free photo sites. The photographers establish the terms, so read the condition, but most pictures can be reused immediately (formerly SXC.hu). elearningart.com: Find royalty free stock photography for eLearning courses. This site has some nice, free, downloadable, useful images. stockvault.com: Stock Vault offers a lot of free images. Just make sure to read license agreements. morguefile.com: Offers stock photographs in high resolution digital. With over 55,000 images, divided into several categories. Evaluate and cite your sources. Describe the theme of your infographic in one sentence. Step 2 - What story do you want to tell? Describe your story in 1-2 sentences. Visualize someone from your target audience. How would they read the data? Summarize the story you want to tell with the data, keeping your audience in mind. Imagine what your data could look like. What data will grab the viewer's attention? Make an outline to show what data is most important. What are the headings and subheadings? Will help you determine flow. Sketch a rough layout (called "wireframing"). Use your outline as a guide for hierarchy. Determine the placement of the most important data and the flow of the rest. 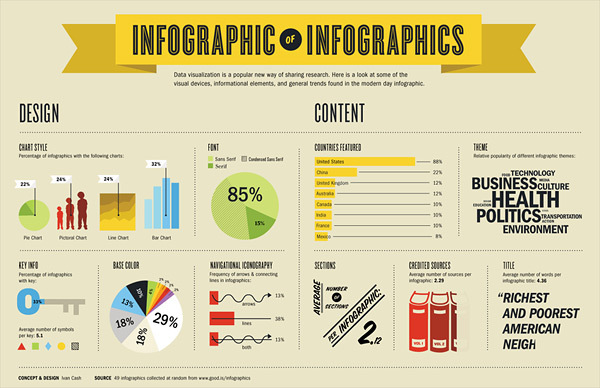 Add color to your infographic.